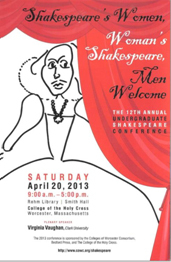 Theme: Shakespeare For "All Time"
This year’s conference takes as its theme Shakespeare through the ages. Time and culture have always influenced interpretations of Shakespeare’s works, their forms, performance, presentation, educational and cultural use. Deadline for 300-word proposals to be submitted online: March 28, 2018. A $20.00 conference fee covers registration and lunch. Please contact Prof. Lisa Gim: lgim@fitchburgstate.edu for more information. 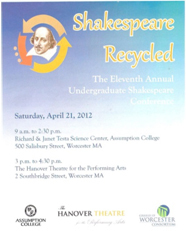 In 2001, Professor Virginia Vaughan called together her colleagues from Worcester's Consortium Colleges to discuss the possibility of organizing an undergraduate Shakespeare conference that would be open to students from all the colleges in the area. The goal was to offer undergraduate students a pre-professional experience that would showcase the important research they were doing in their Shakespeare classes. The Committee also hoped students would find the experience of delivering a paper about their own work and meeting other students with similar interests to be empowering. The Committee picked a theme, identified a guest speaker for a plenary luncheon, and solicited proposals. 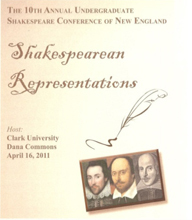 Students were notified, and on April 12, 2002, the first Undergraduate Shakespeare Conference was held at Clark University. Conferences have been held annually since then, and the number of proposals has grown so that the Steering Committee can be more selective. Now that the conference announcement is posted on the Web, we receive proposals from schools as far away as Kentucky, Ohio, and Ontario.